Someone at our house turned six. . . it doesn't seem quite fair that only one person has a summer birthday, so that all of that delicious fruit is available to party with. I guess the rest of us could celebrate halves or quarters. I might have asked this one if she could, pretty please, stay five. I even might have offered up her three siblings' advancing ages in trade, promising to not fret about them getting older. Instead, we made fruit faces. This one is Mikey with a raspberry tongue hanging out of his mouth. While the youngest was doing her best to stop staying young, the eldest was in Minnesota, helping her team win the National title for the Youth Club Championship Ultimate Frisbee, mixed division. 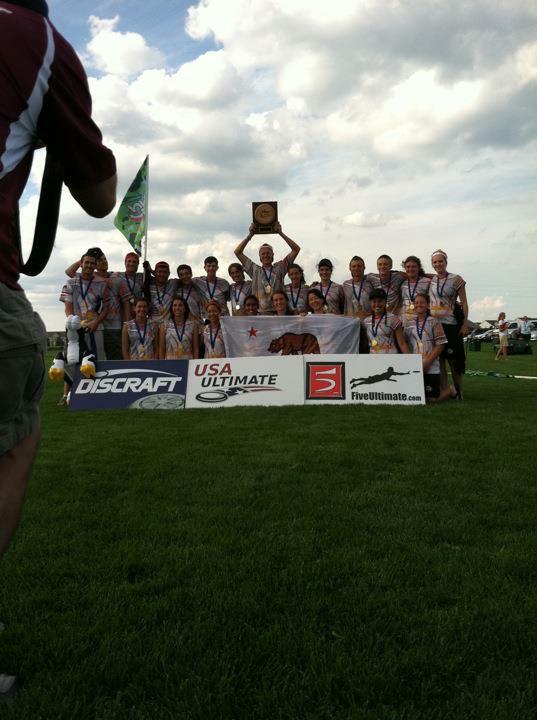 If you don't know about Ultimate, there's a fact sheet here that might convert you. Sarafina sounds a little like Lloyd Dobbler in "Say Anything" talking about "Kick-boxing, sport of the future" when she dreams of a time when Ultimate is an Olympic sport. Watching video of just the winning point doesn't capture the intensity of a whole game, let alone a championship tournament. I only wish I'd been able to go to Minnesota to help out. And in the garden, one type of the beans brought from Italy had dried and are ready for threshing. The crew bagged them and we'll stomp on them this week, I think. Tor is pretty well-trained. When in the garden, check for big zucchini. He's a good zucch picker. The pole beans were big enough to try as shell beans, but I've only seen this kind of thing on favas before. On the left is them fresh out of the pods and boiled; on the right is them with the thick skin slipped off. The very young ones were sweet, kind of like edamame, and the larger ones were more starchy, like favas. Both good. Now I'm wondering what I'll do with the dried ones. Anyone who uses favas for soup have any information? Drying them was my intention. I'm getting to the place that I can't lift heavy supers or deeps down easily, not since hurting my shoulder moving that chicken coop. Eric, however, can. He insisted that we get pictures of him helping. I think we look like a family of marauding polar bears. Even though baby bear had enough pretty early -- the hive was, not exactly agressive, but definitely unhappy-sounding -- the biggest hive was compacted down to two deep boxes and I think three supers, one fresh for filling. This is done by removing the frames that don't have brood in them -- drone brood got fed to the chickens -- and repacking them so that each box has four frames of food and six frames of brood. There were a dozen good brood frames and I'm pleased with the hive's health. I shouldn't have to mess with the brood nest again this season, except to make certain that they have adequate stores at the very end. I'll keep back some frames of pollen and honey in the freezer just in case they need supplementing. And while you can't see her, we saw the queen. Ellie managed to get her covered up by Eric's finger, I think. Bad camera, too. It's very frustrating. Edited to add: No, she's right there. Fingertip, bees, space, queen. She has a little white dot on her back. Drrrr. Anyhow, she still looks pretty good, her tiny dot of paint is still visible, although to my credit, I noticed her by her movements first. That's when you know you're making progress. I also remembered to take out my contacts so I could see eggs close up over the tops of my glasses. That's when you know you're aging. Yesterday was ridiculous -- two trips to dental professionals so that they could hurt Ellie (who has inherited the same bowlegged-cowboy roots to teeth from her dad as her older sister); two trips to grocery stores in between to get ingredients and soft foods; two batches of jam made with Denise and our friend Erika while the children rolled around the house; two dinners of turkey pot pie assembled and one baked; two online classes to set up and oversee. I was actually a bit tired and I didn't get any of the housecleaning except sweeping and dishes done that I'd hoped to do. Nor buy books for Oldest Child's upcoming semester. Argh. Well, today is another day. Often, something I'm currently interested in or trying is just about to crest. Beekeeping? Check. Urban farming? Check. If someone famous starts homeschooling, you'll know who to blame. But I'm apparently way behind the curve here, because despite my incredible Kale Love, this morning was the first time I made kale chips. Those leaves in the top picture have been tediously (oh, so tediously) cleaned of aphids and rubbed -- by hand -- with olive oil, then sprinkled with a bit of salt. And tasted of -- well, I can't describe it. If you like seaweed as a snack, you'd probably like that. I had tea and kale for breakfast, and tea and kale for a lot of lunch. I'm not going to make it frequently, because it's labor-intensive, but if I'm baking anyhow, tossing in a panful wouldn't be too difficult. They're tastier without the ribs, but not as pretty.